Have unlimited fun while twisting, bending, and re-shaping this fun-filled, newest take on the classic Rubik's cube! Rubik's mini Twist-A-Snake puzzle games include pre-consumer recycled plastic, approximately about 90% of plastic in each piece. These are excellent toys promising loads of happiness. Have unlimited fun while twisting, bending, and re-shaping this fun-filled, newest take on the classic Rubik's cube! Rubik's mini Twist-A-Snake puzzle games include pre-consumer recycled plastic, approximately about 90% of plastic in each piece. These are excellent toys promising loads of happiness. They also acts as a potential stress reliever and much more. 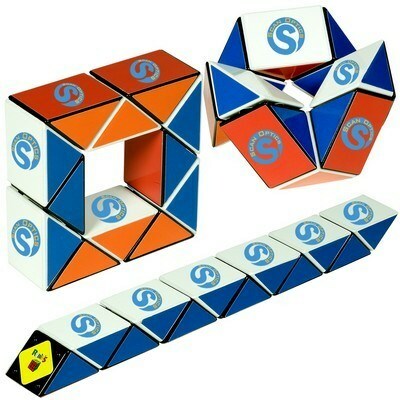 Add your brand logo on all the six white panels of Rubik's Mini Twist-A-Snake to enhance your customer base flawlessly.